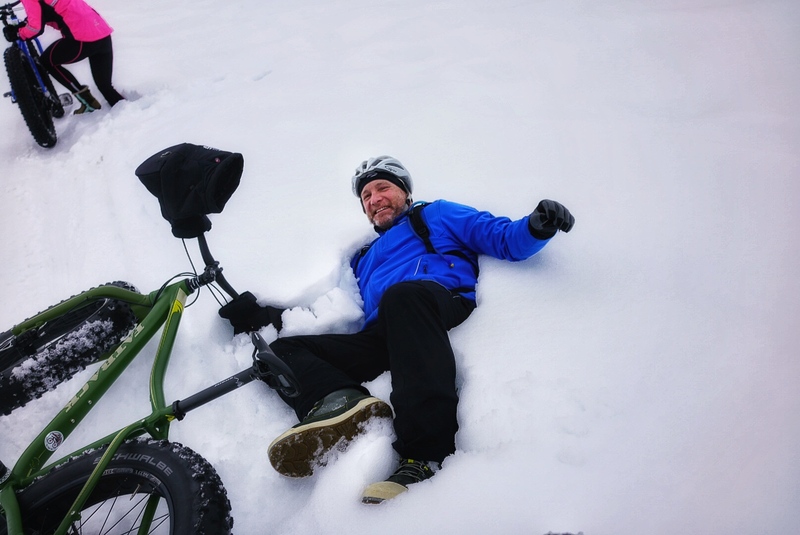 We’re enjoying a couple’s getaway this weekend in Methow Valley riding fatbikes in the snow with friends. North Cascades Cycle Werks set us up with Fatbacks and Methow Cycle and Sport a Trek Farley. The conditions were greasy, but we made the best of it. The scenery was monochromatic with a splash of color. When I first wrote about fatbikes in the snow, most of the narrative was written from rides in this valley. I didn’t know then if a niche of a niche would get traction in the mainstream. Happy to report it has and if you haven’t tried fatbiking yet, you totally should. It’s super fun. Don from Cycle and Sport or Merle from Cycle Werks will set you up. Rentals are about $30.00 for a 1/2 day and Pearrygin Lake State Park is designated for fatbikes. We stayed with friends, but there are plenty of rooms to rent.